Kordjazi, M., Kazemi, A. (2016). Presenting a three-objective model in location-allocation problems using combinational interval full-ranking and maximal covering with backup model. Journal of Industrial and Systems Engineering, 9(special issue on location allocation and hub modeling), 53-70. Majedeh Kordjazi; Abolfazl Kazemi. "Presenting a three-objective model in location-allocation problems using combinational interval full-ranking and maximal covering with backup model". 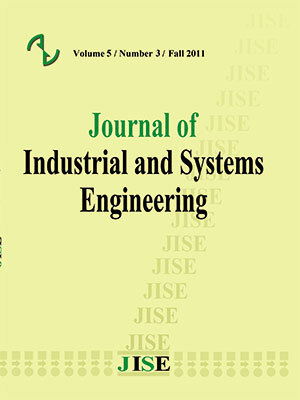 Journal of Industrial and Systems Engineering, 9, special issue on location allocation and hub modeling, 2016, 53-70. Kordjazi, M., Kazemi, A. (2016). 'Presenting a three-objective model in location-allocation problems using combinational interval full-ranking and maximal covering with backup model', Journal of Industrial and Systems Engineering, 9(special issue on location allocation and hub modeling), pp. 53-70. Kordjazi, M., Kazemi, A. Presenting a three-objective model in location-allocation problems using combinational interval full-ranking and maximal covering with backup model. Journal of Industrial and Systems Engineering, 2016; 9(special issue on location allocation and hub modeling): 53-70. Covering models have found many applications in a wide variety of real-world problems; nevertheless, some assumptions of covering models are not realistic enough. Accordingly, a general approach would not be able to answer the needs of encountering varied aspects of real-world considerations. Assumptions like the unavailability of servers, uncertainty, and evaluating more factors at the same time, are a sort of assumptions, with which covering models are always faced; however, these models are not able to find any answers for them. Therefore, how to deal with these sorts of assumptions has been always a big question. In this research, for facing unavailability and uncertainty in input data, backup covering and interval full-ranking model were addressed, respectively. Furthermore, by combining backup covering and interval full-ranking models (also conceptions), not only time was saved and more factors like efficiency and cost were simultaneously evaluated, but also covering considerations were reachable in real aspects. Baron, B., Berman, O., Kim, S. and Krass, D. (2009). Ensuring feasibility in location problems with stochastic demands and congestions. IIE transactions, 41, 467-481. Berman, O., Drenzer, Z., Krass, D. and Wesolowsky, G.O. (2009). The variable radius covering problem. European Journal of Operational Research, 196, 516-525. Berman, O. and Wang, J. (2011). The mini-max regret gradual covering location problem on a network with incomplete information of demand weights. European Journal of Operational Research, 208, 233-238. Chou, S.Y., Chang, Y.H. and Shen, C.Y. (2008). A fuzzy simple additive weighting system under group decision making for facility location selection with objective/subjective attributes. European Journal of Operational Research, 189, 132-145. Church, R.L. and Revelle, C. (1974). The maximal covering location problem. Papers of the Regional Science Association, 32, 101-118. Daskin, M.S. (1995). Networks and discrete location: Models, algorithms and applications. New York, US: John Wiley and Sons. Daskin, M.S. and Stern, E.H. (1981). A hierarchical objective set covering model for emergency medical service vehicle deployment. Transportation Science, 15, 137-152. Erdemir, E.T., Batta, R., Spielman S., Rogerson, P.A., Blatt, A. and Flanigan, M. (2010). Joint ground and air emergency medical services coverage models: A greedy heuristic solution approach. European Journal of Operational Research, 207, 736-749. Ghodratnama, A., Tavakkoli-Mogaddam, R. and Azaron, A. (2015). Robust and fuzzy goal programming optimization approaches for a novel multi-objective hub location-allocation problem: A supply chain overview. Applied Soft Computing, 37, 255-276. Hakimi, S.L. (1965). Optimum distribution of switching centers in a communication network and some related graph theoretic problems. Operational Research, 13, 462-475. Hogan, K. and Revelle, C. (1986). Concepts and applications of backup coverage. Management Science, 32, 1434-1444. Hosseininezhad, J., Jabalameli, M.S. and Jalali Naini, GH. (2014). Fuzzy algorithm for continuous capacitated location allocation model with risk consideration. Applied Mathematical Modeling, 38, 983-1000. Kolen, A. and Tamir, A. (1990). Covering problems, In: P.B. Mirchandani, R.L. Francies (Eds. ), Conf. Discrete Location Theory, Wily, New York, 263-304. Lannoni, A.P. and Morabito, R. (2007). A multiple dispatch and partial backup hypercube queuing model to analyze emergency medical systems on highways. Transportation Research, 43, 755-771. Lee, J.M. and Lee, Y.H. (2010). Tabu based heuristics for the generalized hierarchical covering location problem. Computers and Industrial Engineering, 58, 638-645. Martinez-Salazar, I., Molina, J., Ángel-Bello, F., Gómez, T. and Caballero, R. (2014). Solving a bi-objective Transportation Location Routing Problem by meta-heuristic algorithms. European Journal of Operational Research, 234, 25-36. Moheb-alizade, H., Rasouli, S.M. and Tavakkoli-mogaddam, R. (2011). The use of multi-criteria data envelopment analysis for location-allocation problems in a fuzzy environment. Expert Systems with Applications, 38, 5687-5695. Ni, Y., (2012). Minimum weight covering problems in stochastic environments. Information Sciences, 214, 91-104. Owen, S.H. and Daskin, M.S. (1998). Strategic facility location: A review. European Journal of Operational Research, 111, 423-447. Peijun, G. (2009). Fuzzy data envelopment analysis and its application to location problems. Information Sciences, 179, 820-829. Pereira, M. and Coelho, L. (2015). A hybrid method for the probabilistic maximal covering location-allocation problem. Computers and Operations Research, 57, 51-59. Pirkul, H. and Schilling, D. (1989). The capacitated maximal covering location problem with backup service. Annals of Operational Research, 18, 141-154. Revelle, C. and Hogan, K. (1989). The maximum reliability location problem and a-reliable p-center problems. Annals of Operational Research, 18, 155-174. Shieh, B.S. (2013). Solution to the covering problem. Information Sciences, 222, 626-633. Sohrabi Haghighat, M. and Khorram, E. (2005). The maximum and minimum number of efficient units in DEA with interval data. Applied Mathematics and Computation, 163, 919-930. Thomas, P., Chan, Y., Lehmkuhl, L. and Nixon, W. (2002). Obnoxious-facility location and data envelopment analysis: A combined distance-based formulation. European Journal of Operational Research, 141, 495-514. Toregas, C., Swain, R., Revelle C. and Berman L. (1971). The location of emergency service facilities. Operational Research, 19, 1363-1373. Tsou, C.S. (2009). Evolutionary Pareto optimizers for continuous review stochastic inventory systems. European Journal of Operation Research, 195, 364-371. Vidyarthi, N. and Jayaswal, S. (2014). Efficient solution of a class of location–allocation problems with stochastic demand and congestion. Computers and Operations Research, 48, 20-30. Wen, M. and Kang, R. (2011). Some optimal models for facility location-allocation problem with random Fuzzy demands. Applied Soft Computing, 11, 1202-1207. Zanjirani, R., Asgari, N., Heidari, N., Hosseininia, M. and Goh, M. (2012). Covering problems in facility location: A review. Computers and Industrial Engineering, 62, 368-407. Zarandi, M.H., Davari, S. and Haddad Sisakht, A. (2013). The large-scale dynamic maximal covering location problem. Mathematical and Computer Modeling, 57, 710-719.